MILLIONS ARE TAKING VITAMIN PILLS THAT ARE DOING THEM LITTLE GOOD. LOW ABSORPTION RATE WITH PILLS, AS LITTLE AS 10%. ALLERGIC REACTIONS AND SIDE EFFECTS TO SHELLAC, YEAST, SUGAR, FILLERS, COLORS AND BINDERS FOUND IN PILLS. ABSORPTION RATE IS ALMOST INSTANTANEOUS. VITAMIST ORAL SPRAYS - NO BINDERS, NO FILLERS. NO SWALLOWING PROBLEMS WITH VITAMIST. TAKE THE VITAMIST CHALLENGE TODAY! YOU'LL NEVER GO BACK TO PILLS AGAIN. CHECK OUT OUR FREE VITAMINS, FREE HEALTH NEWSLETTER, MAJOR ONLINE DISCOUNTS, 30 DAY GUARANTEE BELOW! Exciting New Products Are Being Added All The Time! Click on your special interest or need. Stay on top with the latest health news - Click on Free Newsletter. Specific Health Concern? - See how we can help with our A to Z listing in Health Guidelines. 20% discount and free s&h if you join our vitamin club! - Click on PRODUCT LIST. NEW PRODUCTS AND NEW HEALTH INFORMATION UPDATED FREQUENTLY! 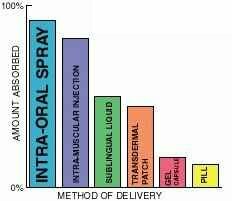 Micro-liter oral absorption (Vitamist sprayed into the lining of your mouth) provides quicker and more complete absorption. 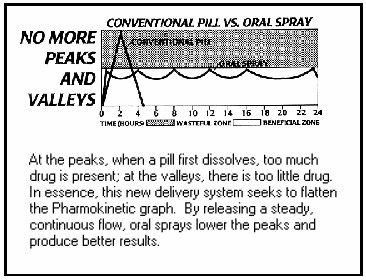 The optimal usage of four sprays per day deliver a steady stream of nutrients all day, avoiding the ìpeaks and valleysî associated with ingested pills. GET MAXIMUM HEALTH BENEFITS TODAY WITH VITAMISTÆ ORAL SPRAY! 10% DISCOUNT AND 100% SATISFACTION GUARANTEED! Your #1 Choice for online service! We are happy to offer these unique and innovative Spray Nutrients (vitamins, minerals and food supplements) to consumers worldwide. All KareMorÆ products are manufactured using high grade, pure and natural ingredients. All products use natural flavorings and pure fruit juices. No artificial colors or sweeteners are in any KareMor product. These products are sold as nutritional supplements to achieve and maintain health. Consult your physician regarding the use of any supplements, especially if you are on medication or under medical care. an independent distributor of KareMorÆ International, Inc.
Let us know how you like our Spray Vitamins! All Text, Graphics and HTML code are protected under U.S. and International Copyright Laws and may not be copied, reprinted, published, transmitted, translated, hosted or otherwise distributed by any means without explicit written permission from the Copyright Holder(s). All Trademarks (TM) are owned by their respective holders. Web page designed and maintained by I.A.M. All rights reserved 04/17/98. Contact SoEasy4All@AOL.com.